Of course, a hero is only as good as his villains, and Ivanhoe has some dangerous foes in Prince John (the wolfish, sneering Guy Rolfe) and the foremost of the Norman knights, the arrogant Bois-Guilbert—played by George Sanders, and now you know we’re in for a good time! The movie was filmed in and among the castles of Scotland, so the scenery is fabulous, and the castle interiors are properly cramped, stony, and asymmetrical. Some of the weapons are wrong for the period, but the knights’ armor is right, suits and coifs of chainmail rather than the plate armor of later times. 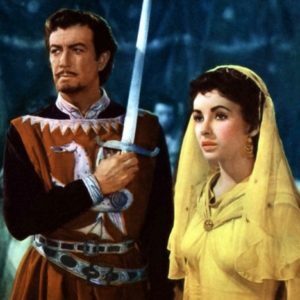 The film is bookended by two knightly tournament scenes, both classic in their way, but they’re outdone in the middle by the exciting siege and assault on a castle, when the Saxons, led by Robin Hood (Harold Warrender), finally rise against the Normans. If you’ve ever looked at a Medieval castle and wondered how the devil attackers could get across a moat and up a sheer wall in the face of bolts and boulders, Ivanhoe shows you how.